The DELV-WFORM-7-AB 7" Camera-Top Monitor Bundle from Delvcam comes with a DELV-WFORM-7 monitor and a Gold Mount Battery Plate. The DELV-WFORM-7 is a versatile 16:9 broadcast monitor with a resolution of 1280 x 800. It provides a wide range of A/V connections for compatibility with SD and HD signals. Inputs include one HDMI input and analog composite and component inputs via BNC connectors. An HDMI output lets you duplicate and send your video content to an additional monitor. The DELV-BPAB Gold Mount Battery Plate allows you to mount a Gold Mount battery onto your DELV-WFORM-7 camera-top monitor. 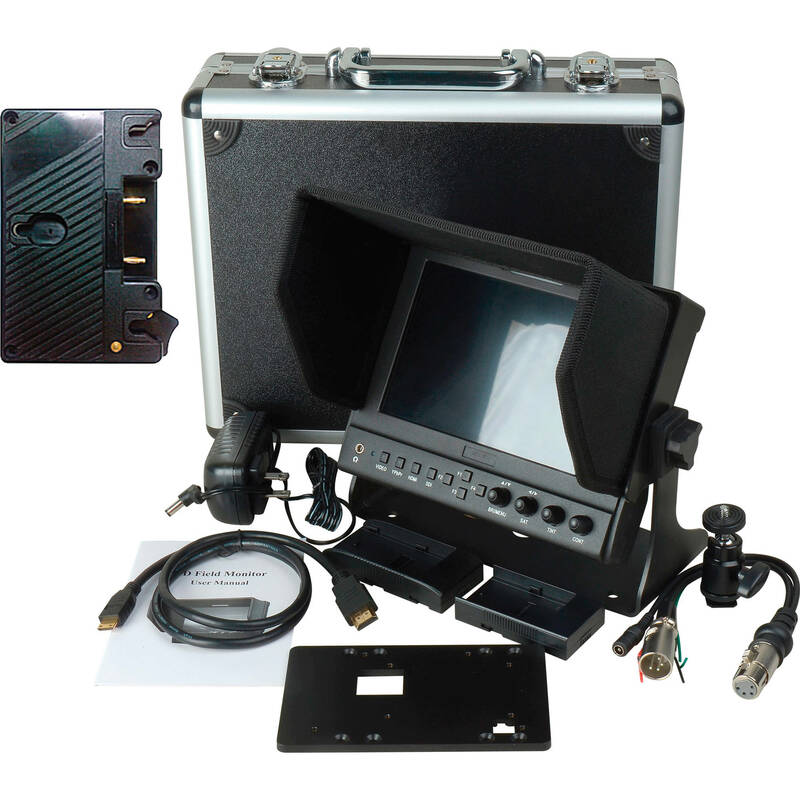 The Delvcam 7" On-Camera HDMI Monitor with Video Waveform is a versatile 16:9 broadcast monitor with a resolution of 1280x800. It provides a wide range of A/V connections for compatibility with SD and HD signals. Inputs include one HDMI input and analog composite and component inputs on BNC connectors. An HDMI output lets you duplicate and send your video content to an additional monitor. The 7" IPS LCD is LED backlit and provides a wide 178° horizontal and vertical viewing angles and an 800:1 contrast ratio. A selection of advanced monitoring features are available to help you properly exposure and focus your shots. Features include waveform, histogram, vector scope, false color, and focus peaking. A 1:1 pixel mapping function is also available, allowing you to view the original resolution of your footage for more accurate focusing. Four programmable function buttons provide quick access to the features you use the most. The monitor is powered from 5 to 12 VDC via a male 4-pin XLR connector or with a single Canon LP-E6 or Sony NP-F970 type battery with the included battery plates and battery plate bracket. Also included with the monitors is a desktop stand with yoke mount, detachable sunhood, HDMI cable, tally cable, power cable, and DC adapter. A briefcase style carrying case comes included for safely storing and transporting the monitor. The DELV-BPAB Anton Bauer Battery Plate from Delvcam allows you to mount an Anton Bauer battery onto your DELV-WFORM-7, DELV-WFORM-7SDI, DELV-SDI-10, DELV-SDI-7, or DELV-HDSD-10 camera-top monitor. Box Dimensions (LxWxH) 12.9 x 11.2 x 4.85"
Box Dimensions (LxWxH) 6.0 x 5.0 x 3.5"
Does this monitor accept an SDI-HD signal from the BNC input? No, the BNC connectors cannot take an HD-SDI signal. This monitor can only accept Component or Composite by BNC. HDMI is the way to get digital HD into this monitor.